It was tough, but my first week as an outdoor education camp counsellor went well. We had about 62 students from Zurich International School (ZIS), and I had 12 members in my counsellor group (ages from 9 to 10 years old). It was a dynamic group to say the least. Some other counsellors reported that their groups were always attentive, and very well behaved. My camp name is Weka, and by the end of the week, Team Weka was defnintely my favourite group. The kids were outgoing and keen to give all the challenges a go. There were some strong personalities in the group, but with these tamed and directed, the group tackled the team work exercises with gusto. The photo above, kindly taken by one of the ZIS teachers, shows a particular episode where Team Weka harvested about 40 small tadpoles from a pond. Even the girls were keen to get in there and grab a few tadpoles for the bag. At first, the general consensus was that everyone would take a few tadpoles home each. However, after discussing the impact of humans on the natural world, we all took a vote on what would be the most caring thing to do. It was an almost unanimous vote to let the tadpoles go. My specific role this week was to be the overall ‘overseeer’ of my group. 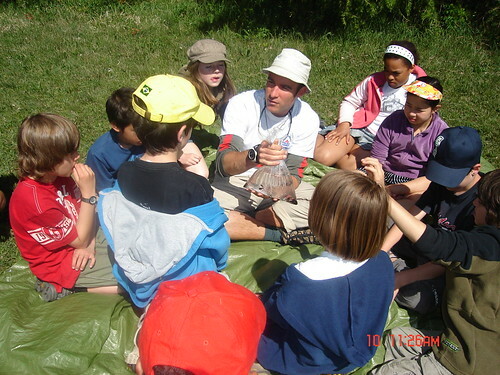 Specific skills such as living with nature, map skills, rock climbing etc were instructed by a specialist. I may have a chance to operate in a specialist role next week. Apart from work, I had the opportunity to do a couple of day rides around the area. There are some great mountian bike tracks on which my recumbent performs remarkably well. A fasctinating feature of the Valais region in Switzerland is the abundance of irrigation channels dug into the mountain side. These are called ‘bisse’ and in the immediate vicinity of Anzere, there are three important bisse. The Bisse de Sion, Bisse de Ayant, and Bisse de Clavant. These irrigation channels take water from high up in the mountains down to the many vineyards in the region. All along the bisse are walking and mountain biking tracks. On Saturday I went out for a ride with Dee, an Irish lass who was only here for the first two weeks of camp before returning to Ireland. To the right of the track in the photo above, there is a channel of water. 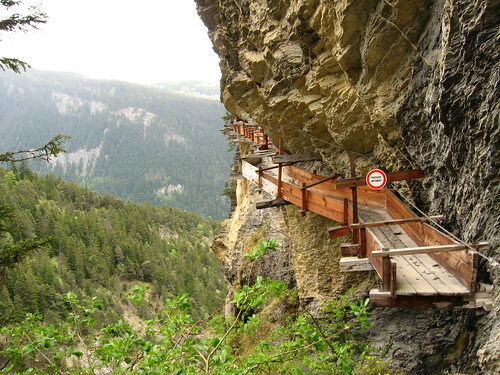 This is one of the bisse that runs from below Anzere all the way down to Sion. An altitude drop of about 700m. A novelty was seeing a steep vineyard cart in action. Not for the squeamish for hights. Today I went on another ride, this time up the valley to Lake Tzeuzier, with Simon and Eric, two others involved in Village Camps. We followed the Bisse de Sion up the valley, and the Bisse de Ayant back down to Anzere. The track is quite rocky in places, and exposed tree roots posed a problem at times. All in all however, 8 months on the recumbent meant that I handled the terrain with much more ease compared to my companions on their mountain bikes. The recumbent still ceases to amaze me. 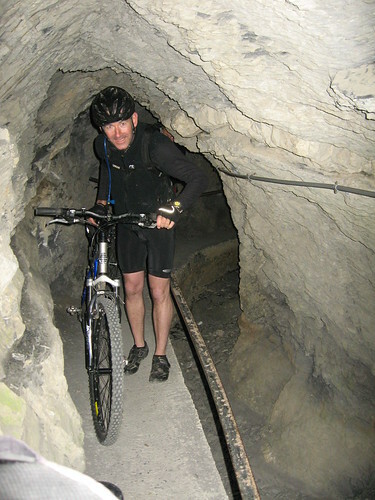 Here we have Simon navigating the new tunnel to take the Bisse de Ayant past a cliff face. Below is how they used to do it. This wooden bisse counstruction was made at the turn of the 20th century, using fairly basic tools. Apparently prisoners were the construction workers of the time. what, if anyhting, have your co-workers had to say about your bike. "Just as NZ's catch-phrase is "land of the long white cloud", Korea's is "dynamic". We see this reflected in many things here, including the tap water (if you'll pardon the pun). You never know exactly what's going to come out when you turn on the tap but it's always changing – sometimes it just has a bad smell, other times you get a variety of colours too. We found out they make different coloured bread here too… but only after we bought a yellow loaf. Now when we buy bread we check to make sure it's not… dynamic." Looks like the camp is turning out to be fun for you, AND you have enough free time to still get in some amazing rides. It certainly appears that you picked an ideal region to camp out in for a while! i think my last post disappeared into the vast ocean of the internet information highway (huh?). Anyway Switzerland has many privately owned micro-railways and the vineyard train is one of em. 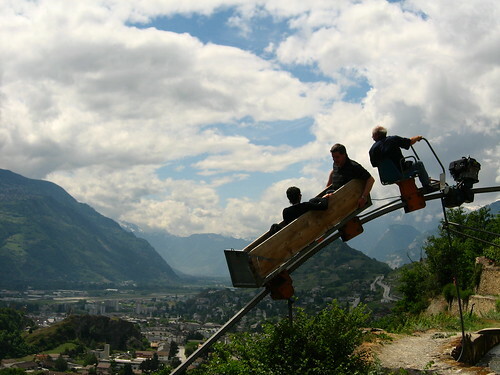 It was only four years or so ago when i was in Anzere and Sion. Have you had a chance to visit Evolene? check the local papers (if you can read it) for some folk festivals which can be awesome. If you have a cheap FM radio there are a few good radio stations to tune into for some Swiss folk music (not just Jodel)as there are many conservative people live there with no telly (oh I don't have a telly either!!). Such music are so beautifully matching to the landscape and also almost always uplifting (and Dynamic he he). Where did the name 'Weka' come from. it sounds very Maori to me. How do you communicate? Do most of the kids know a bit of English? Glad to hear that you are still enjoying yourself. The countryside is amazing. Those monorail 'grape train' pics are awesome! Hey I know gravity and they just shouldn't work ~ I want a go! I've seen some other off-road recumbent stuff on youTube. Aunty Les, Weka is the name of a native New Zealand flightless bird. Looks like a kiwi, but has a big short beak instead of the long nose. Now do you have the idea? 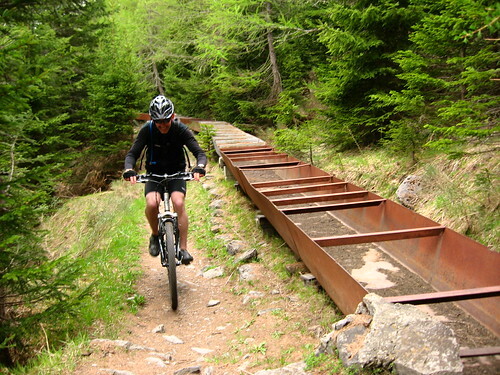 Hey Rob, nice to read about your mountain biking on the Streetmachine. After all you've been through, riding without a big load must be a piece of cake! Did you put knobbies on? Richard, I still had my nice and slippery Schwalbe Marathon Plus on the front, and the only slightly more grippy Marathon XR on the back. They are OK on the dry, hard packed stuff, but are understandably useless on the wet muddy stuff. Tim, I had some rather sceptical comments when I said that I wanted to go mountain biking with them. Everyone was convinced that I would not be able to cycle the 'narrow' mountain bike tracks on my recumbent. I think they were all suitably put in their place when I had to keep waiting for them to catch up! I do however miss being able to lift the front wheel of the bike over bigger obstacles like tree roots and rocks over about 15cm high. At times like that I have to do a quick dismount and lift the bike over the obstacle while moving. Now that I'm used to it, this does not affect my pace all that much. Are those Shimano SPD boots also good for hiking? Do you remove cleats and cover the holes? 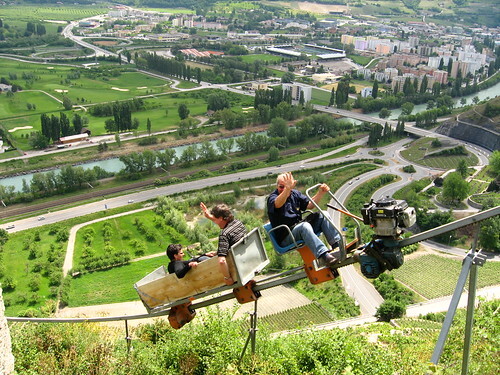 Great photos really enjoyed the vinecart….I can see occupational Health and Safety in New Zealand giving it the big thumbs down….but what a great experience, who maintains them, private, local council or state? Really love your travel log! You are a superstar! 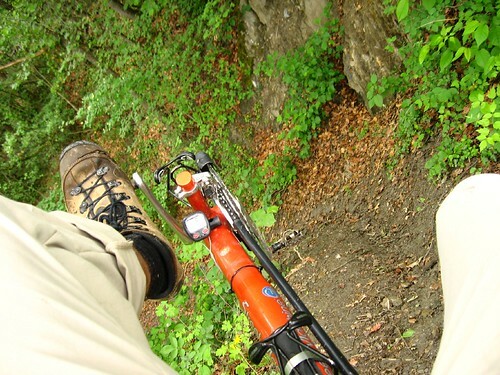 Satoshi, the Shimano SPD boots are OK for hiking. However, they are not particularly robust. I ripped a big hole in the leather upper on an exposed tree root on my first day at Village Camps. I hope they hold up for the rest of the season. Uncle Linsday, I'm pretty sure the vineyard carts are privately owned and maintained. I imagine that there are some fairly strict regulations.